These gorgeous cookies are made with Bob Red Mill's 5 Grain Rolled Hot Cereal as their key component then loaded up with shaved coconut, slivered almonds and dark chocolate chips. If that isn't your preferred flavor combo then feel free to try out what you like: dried cranberries, walnuts, pecans, raising, diced dried apricots, dates.... It's all good ! I was looking for a cookie that would be filling, somewhat healthy and also work well as a breakfast treat too. I found it with these guys. Not too sweet and filled with goodies. They checked off all the boxes! 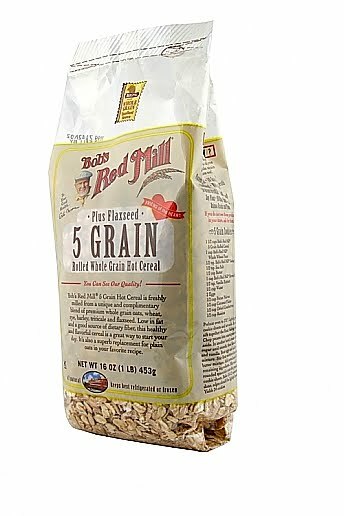 I have been eating Bob's 5 Grain Rolled Hot Cereal for years now and noticed just this past weekend that there was a cookie recipe right on the back of the bag that looked appealing. After reading the ingredients list I was hooked though I did change the add-ins. I love the crunch and health benefits of almonds. My kids love chocolate. So even-steven. But I have more ideas too. The next batch will be filled with a Xmas dried fruit mix (raisins, currants, mixed peel) for a perfect festive treat. These make lovely, fat and moist cookies that tend not to spread out too much during baking. The recipe also makes a slew of cookies. In total I had nearly 40 when finished. I am not sure if they would freeze well or not so for now they are simply resting nicely in my biscuit tin knowing they have a short life span; the pile is getting smaller and smaller each day. thanks, Gail ! hope you enjoy them :) for us, one staple around here is Bob's Gluten-Free Oats. A must have ! These look delicious AND healthy! What more could someone ask for? Hope you will consider submitting these to Healthy Aperture so we can share them with our fans. I am looking forward to trying these and I've pinned them on Pinterest.